Do you think that any content marketing is good content? As a marketer, you need content quality stand out. You’ve got 10 seconds or less to capture visitor attention according to usability experts, Nielsen Norman Group. According to Google’s Eric Schmidt, “Every 2 days now we create as much information as we did from the dawn of civilization up until 2003.” That’s roughly 5 exabytes of data. Mary Meeker of KPCB reported that content is growing at an exponential rate. 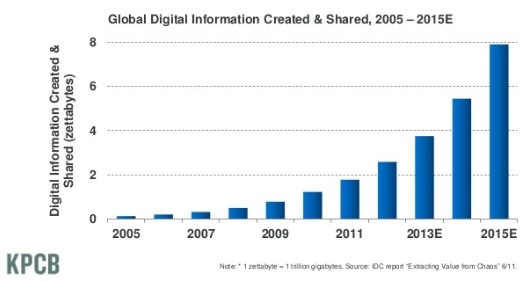 It’s expected to reach 8 zettabytes by 2015. While these numbers are impressive (an exabyte is a billion gigabytes) we understand that all content is not created equal. More than ever before, we need filters to separate the good content from the bad. You need content quality to stand out! Here’s how 25 content marketing experts define content quality. Quality content is clear and concise. It’s easy to understand. It’s relevant. It’s written for humans, but optimized for machines. And, it’s presented in a way to be accessible to all who need it. Content Quality is whatever gets the job done. What is the content supposed to do? Is it supposed to improve brand favorability, get people to click a link, get people to purchase something, make someone fill out their contact information, get a lot of people to share that content, spark conversation, or generate testimonials? There isn’t any universal measure for content quality. It’s inherently tied to the marketer’s goals for the content. I follow the 3 Ps of content quality. These 3 elements are the closest thing to a formulaic approach to content quality. Punctuation. A well-structured story opens with a compelling introduction, follows with the main point and closes with a summary, all written with good grammar and punctuation. Polish. Image matters…Stylized formats and relevant images help to create a good user experience. Of course, great image doesn’t transform poor content into good content. It does enhance it though. Power. The purpose of content is to cause a reaction. When content causes the consumer to act or change behavior or thinking, that content has power. Content quality is simple: did it inform, educate or entertain someone? The higher the quality, the more it will have achieved one of those goals for a larger group of people. Quality content is what your audience values as meaningful and relevant. Newspapers and magazines (most) put out quality content to their readers/subscribers. Quality content is well written and has a purpose. Quality content can be quite simple content, it does not need an expensive platform or incredible visuals (although visuals help). My favorite writer of the month (thanks to David Meerman Scott) is Bob Lefsetz of The Lefsetz Letter. This is a super example of quality content, no bells and whistles, but it is incredibly valuable to the audience. Content quality is content that adds value in the minimum amount of time. Seth Godin writes very short content but provides a lot of value. Neil Patel produces fantastic detailed guides that are many pages long but the content adds a lot of value. Quality content is core to your marketing. Apple’s 1984 ad was a classic example of quality content that positioned and created a brand. Quality content is customer-centric and speaks in a human voice to provide your audience with the information they need and seek. It’s presentation and grammar facilitate consumption. Quality content supports search optimization, makes your content stand out from a flood of other messages, and provides the basis for increased resources. Here’s the full list of the 17 elements of content quality. 8. Andy Crestodina – Orbit Media; author of Content Chemistry. In Analytics, “bounce rate” and “average time on page” are two metrics that give some sense for quality. If nothing else, they indicate that people aren’t running away. There is a better way to measure how compelling a post is: measure the conversion rate from visitors to newsletter subscribers for that specific post. If the conversion rate it high, the post inspired enough trust to get visitors to subscribe. That’s an excellent measure of quality. The number of comments and shares are also indications of quality. All other definitions of quality are subjective. This is really exciting for us because Content Quality used to be subjective but the new publishing models have changed that. First, we had social media that gave us precise engagement measures: even Google has to change its algorithms to take that into account. Today, content that is shared/curated = good content. But beyond the social phenomenon, there’s another model that’s appearing: the interest graph. Platforms like Quora, SlideShare, Pinterest or Scoop.it are about publishing and discovering content not to/from people you know but based on your interests: that changes everything because our quality judgment is highly based by our level of interest. Companies that leverage the interest graph will highly increase the perceived quality of their content. Originality. Is the content expressing a perspective that I’m getting nowhere else? Authority. Even if the opinions expressed aren’t original, is the author well establish on this topic. Reliability and consistency. Does the reporting source consistently act as a reliable source of content for this topic? Depth. Does the article have comprehensiveness and depth, or is it just shallow fluff? BTW, here are some attributes that Google News looks for that line up with these as well. Content Quality is in the eyes of the beholder, so to speak, which might apply to the creator and/or consumer of the content. You might gauge quality by its reach, pull, conversion, or any measure you define as an objective. If you look at content quality at large, my take is the best or high quality content succeeds in educating, entertaining and inspiring action, but the definition of “action” is up to you. Content Quality is all about understanding your audience, then developing compelling content that engages them and reinforces whatever message your brand is trying to communicate. And, it’s important to be consistent. If you’re Old Spice, you want to be edgy and funny. But that approach wouldn’t work for Volvo (though they did break through their safety-centric marketing with the Jean Van Damme split video. My formula for content quality is the same as innovative content. It needs all those 3 things, I believe. Content quality is relevant, transparent and respectable/respected. Beauty is in the eye of the beholder and quality is no different. If your content meets a need, it has utility in the eyes of those who consume it, therefore it is quality content. Quality could be its ability to solve a problem or just its ability to entertain or educate. Quality is about being fit for the purpose. Let’s not forget the YouTube effect. On YouTube quality does not mean high-production values. This is no longer necessary or then norm. Today, over-produced content can look inauthentic. Personally I’d rather have something in spoken word from people in the front line that something wonderfully crafted and scripted. Word of the customer speaks to the power of personas. It makes your content resonate. It does a better job of getting past our spin filters. There’s something human about flaws. It makes you approachable. Believability is critical or your content will not be consumed. It’s my view that people want simple speak. They want to hear the person through the words. Quality is in the value that is conveyed and how memorable it is. Quality is not owned by the grammar police and the typo trolls. Perfect is often forgettable. 16. Arnie Kuenn – Vertical Measures and author of Accelerate. Content quality can vary greatly depending on the type of content being produced, but overall, I believe the specific attributes are: usefulness, relevance, and accuracy. Content must be useful and relevant to your audience. Your content should educate, entertain, inspire or convince your audience, otherwise it will get lost in the sea of mediocre. Usability is also a key factor in content quality as well, as being able to consume content easily is necessary in our instant gratification-expectant world. Additionally, accuracy is extremely important, as content marketing is about building trust. Content Quality is different for every project, but all content should pass the following smell test: does it answer your target audiences’ questions? Does it reflect your brand in terms of voice/tone and personality? Content Quality. Bad content makes me angry. All content begins with knowing who you’re writing for. People know when you’re faking it and if you fake it, you won’t make it. You want to be engaging and clear, relevant to the reader’s interests and goals. And you need to get it right from structure to grammar to spelling to brand tone and voice. Drop the ball on any one of these and you will fail. Quality content is content that meets business objectives. That’s it. By that, I mean it generates leads, opportunities, and customers. When I look at our content, I look at it through a revenue-tinted lens. And, right now, we’re pushing out new ways of quantifying value based on this principle. It’s the most important factor for marketers to analyze and, ultimately, improve their content marketing efforts. Quality content is content that consumers want to consume, yet still conveys the company message or brand. Quality content is a subjective thing and what is right for one audience is not right for another. Coca Cola’s Super Bowl ad “America the Beautiful” was loved and hated. Ultimately, content quality is determined by the usefulness to the reader. Typically, they will ask themselves, “Am I learning something new?” or “Is this actionable advice I can use today?” If your content is answering “Yes!”, then you’re on the way. If readers are thinking, “OMG, I must share this now!” then you are doing it right for certain. At ThomasNet, a strong indicator of our content’s quality is indicated by the engagement it receives – are readers commenting on it? Are they sharing it and starting conversations with their communities? For instance, as part of our annual Industrial Marketing Barometer survey, we shared a simple stat that demonstrated growth in the US manufacturing sector. It received an unusually high amount of social engagement since it stated the opposite of what everyone in our space was thinking. Homerun. In fact, the survey continues to be quoted long after it was published. Engagement activity is a solid indicator of quality. Though keep in mind that not all actions are measurable. For example, readers may discuss your absolutely brilliant content while standing around the Keurig, and you can’t be there to witness it, nor enjoy a cup of that mysterious miracle coffee. At the end of the day, content that resonates with your audience is quality content. That should be the final goal of any content you write, and it indirectly will help you generate better search engine rankings, which is one of the traditional definitions of content quality. Content “quality” has several attribute considerations — the most import of which is relevance. Without relevance all other factors are irrelevant. To tangibly measure “relevance”I created the Triangle of Relevance content methodology where content can strategically be planned to simultaneously serve 1) audience need, 2) business interest/solution, and 3) contextual/time significance. Content optimized as relevant for all three factors unites both user and business goals in a fashion that matters here and now. Beyond relevance, other factors obvious play a part for quality content from a search marketing, user experience, and conversion perspective. I use the five factors below to prequalify and score content quality. Performance (e.g. fast-loading content, actionable content, measurable events, success metrics, etc. Content quality might defined as content that delivers value, that solves a problem, that consists of great writing and that tells a story. Ultimately though, content quality is defined by your audience and their expectations of you. It is about delivering what they need in a way that they can apply it to their world. Content quality stands out and pulls your audience in. In today’s content rich world, it’s a marketing must. 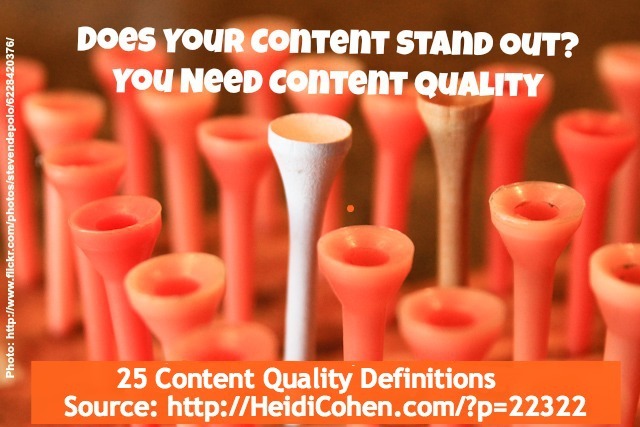 What’s your content quality definition? Please add it in the comment section below. Tags Ahava Leibtag, Andy Crestodina, Angie Schottmuller, Ann Handley, Arnie Kuenn, Barry Feldman, Bernie Borges, Content Quality, David Berkowitz, Dayna Rothman, Doreen Moran, Guillaume Decugis, Heidi Cohen, Ian Cleary, Ian Hutchinson, Lisa Buyer, Michael Brenner, Murray Newlands, Neal Schaffer, Nick kellet, Pawan Deshpande, Phil Paranicas, Scott Abel, TOby Mrudock. Bookmark the permalink.